FREE Target $10 Gift Card When You Spend $50 On Home Decor! You are here: Home / FREEbies / FREE Target $10 Gift Card When You Spend $50 On Home Decor! 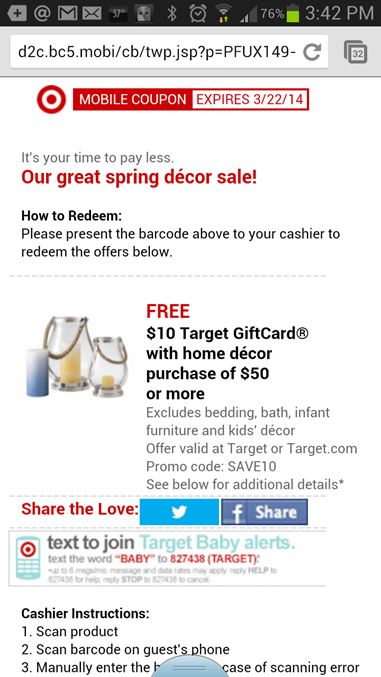 FREE Target $10 Gift Card When You Spend $50 On Home Décor! Target has some really nice mobile coupons! You can get a $10 Target Gift Card When You Buy $50 or more in home décor items! Just text: DECORATE to 827438 to get yours. You can get this same deal online, too! Just click here and use code: SAVE10 at checkout!